flap and reshaping the cornea. In another type of surgery, the flap is created with a manual incision, rather than a laser. 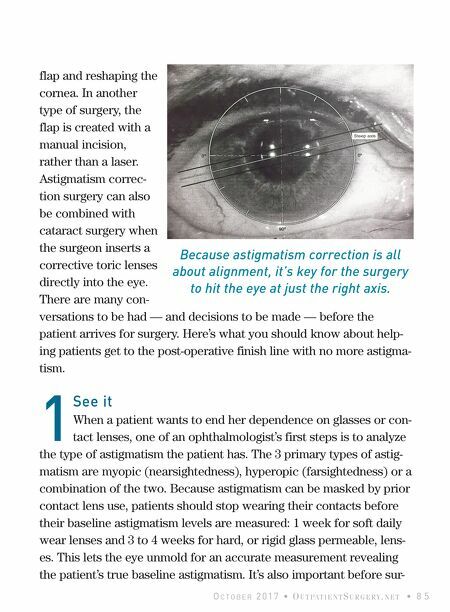 Astigmatism correc- tion surgery can also be combined with cataract surgery when the surgeon inserts a corrective toric lenses directly into the eye. There are many con- versations to be had — and decisions to be made — before the patient arrives for surgery. Here's what you should know about help- ing patients get to the post-operative finish line with no more astigma- tism. 1 See it When a patient wants to end her dependence on glasses or con- tact lenses, one of an ophthalmologist's first steps is to analyze the type of astigmatism the patient has. The 3 primary types of astig- matism are myopic (nearsightedness), hyperopic (farsightedness) or a combination of the two. 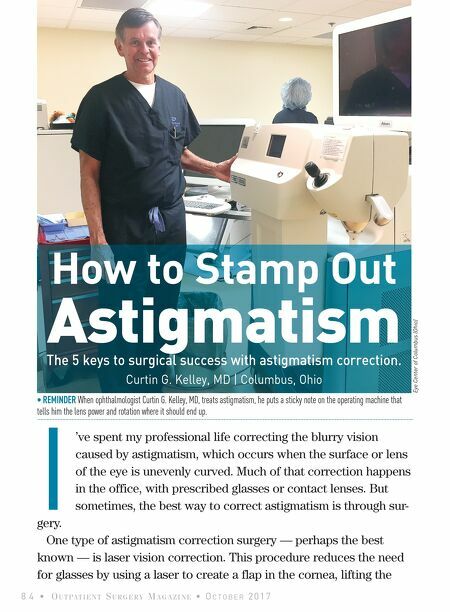 Because astigmatism can be masked by prior contact lens use, patients should stop wearing their contacts before their baseline astigmatism levels are measured: 1 week for soft daily wear lenses and 3 to 4 weeks for hard, or rigid glass permeable, lens- es. This lets the eye unmold for an accurate measurement revealing the patient's true baseline astigmatism. It's also important before sur- O C T O B E R 2 0 1 7 • O U T PA T I E N TS U R G E R Y. N E T • 8 5 Because astigmatism correction is all about alignment, it's key for the surgery to hit the eye at just the right axis.